This week features visiting artists at the top of the game—trumpeter Jeremy Pelt, bassist Christian McBride, and bassist/vocalist Meshell Ndegeocello, along with some local improvisors and prime-time vocalists. One of the most talked-about trumpeters of the past decade, Jeremy Pelt won Downbeat’s “Rising Star Trumpeter” five years running. Now it seems inaccurate to call him a “rising star.” He’s high in the sky! 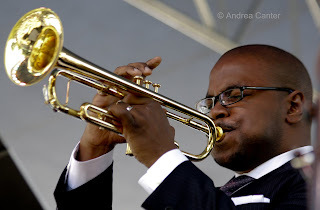 Now he’s been with the Mingus Big Band for over a decade, as well as the Roy Hargrove and Duke Ellington Alumni Big Bands along with smaller ensembles like the Cannonball Adderely Legacy Band and Lewis Nash Septet. His own fiery quintet has been on tour but this weekend just Pelt comes into the Artists Quarter (5/14-15) to lock his horn with our own fiery band, with Tanner Taylor, Jay Young and Phil Hey. He’s doing two ticketed sets each night, 8:30 and 10:30 pm, so don’t follow your usual AQ timeline! The Dakota hosts one of the most engaging events of the year on Sunday afternoon, the annual Jazz Piano Competition for high school students, sponsored by the Schubert Club and Dakota Foundation for Jazz Education. For the sixth competition finals, three students (from Robbinsdale, Northfield and Colorado Springs) will perform three compositions each, with a “backup” trio of Gordy Johnson and Phil Hey. Just the experience of playing with such stellar pros should make the afternoon worth the effort, but these three finalists also vie for a $500 Performance Prize on top of the $500 scholarships already won. Judging is informative and entertaining, with comments from the three adjudicators—Phil Aaron, Mary Louise Knutson and special guest, Christian McBride. No charge and open to all, at the Dakota from 2-4 pm. Stick around, Christian McBride is also in town to perform at the Dakota (5/16-17) with his Inside Straight quintet, one of the hottest commodities on the modern jazz scene. McBride of course already is one of the living legends of the bass and not yet 40. 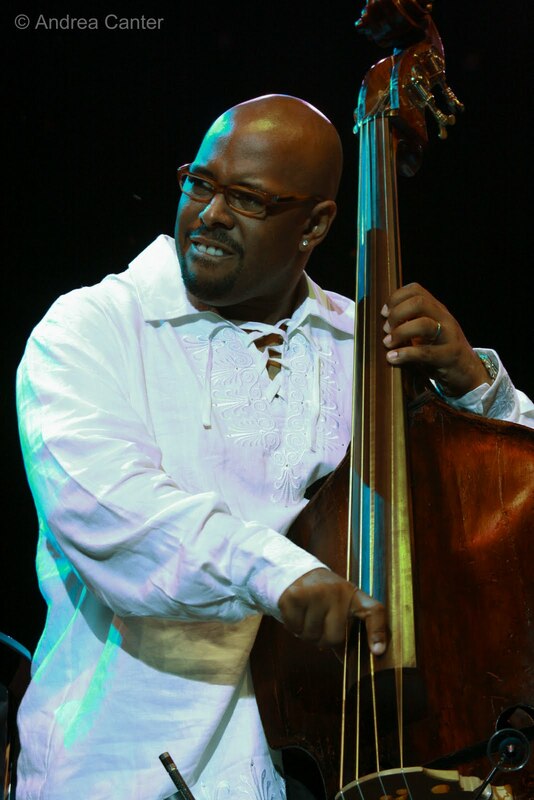 He’s served as Artistic Director for such organizations as the Los Angeles Philharmonic and Detroit Jazz Festival, but his true genius is his straight-ahead bass and bandleader skills. Case in point, Inside Straight, featuring the consistently burning highjinks of pianist Eric Reed, vibes master Warren Wolf, saxophonist Steve Wilson and drummer Carl Allen. If you saw Meshell Ndegeocello’s electronic show last year at the Dakota, you might want to take another listen as she brings her “Best of Bitter” to the Dakota this week (5/18-19). This time it is all-acoustic, a reinvention of her 1999 pop classic, Bitter. She’s one of a kind, impossible to classify. On the avant side of the stage, Luke Polopnick, Chris Bates and David Seru appear at Café Maude on Friday (5/14); the Copper Street Brass Quintet with tubaist Stefan Kac and guest drummer Reid Kennedy perform a unique mix of rock, funk and jazz in Antonello Hall at MacPhail on Saturday night (5/15); the Regional Jazz Trio (Anthony Cox, JT Bates and Mike Lewis) with Luke Polopnick takes over the Clown Lounge on Monday (5/17). Best bets for song: Catch Nichola Miller twice this week, on Saturday (5/15, 11 am -1 pm) at the Mill City Farmer’s Market and on Thursday (5/20) with Rick Carlson at Spoon River; Charmin Michelle on Sunday (5/16) for brunch at Crave in the West End Shops and at Fireside Pizza Monday (5/17) and Wednesday (5/19) with Denny Malmberg; Arne Fogel on Tuesday (5/18) at Hell’s Kitchen; Debbie Duncan with Mary Louise Knutson at Camp Bar on Tuesday (5/18), while Debbie appears again at Hell’s Kitchen on Thursday (5/20); Nancy Harms with the Wolverines at Hell’s Kitchen on Wednesday (5/19); Maud Hixson at Erte on Thursday (5/20), while Christine Rosholt fronts Beasley’s Big Band that night at the Wabasha Street Caves. More straight head/modern jazz: Joan Funk and Jeff Brueske at the Lobby Bar of the St Paul Hotel (5.14-15); Sophia Shorai at Dakota Late Night (5/14) and Red Stag (5/16); Atlantis Quartet at Riverview’s Café Mocha (5/15) and Riverview Wine Bar (5/16); Cory Wong Quartet and Tuesday Night Band (5/18); How Birds Work (5/19) and the Brian Grivna Quartet (5/20) at the Artists Quarter.